The book is intended to serve both as a reference manual and as a cover-to-cover exploration of Ethereum. 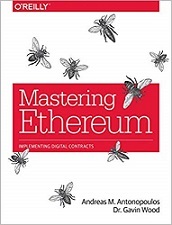 If you're looking to get started with the Ethereum protocol - or are among the many open source developers, integrators, and system administrators already working with this platform - Mastering Ethereum is the definitive book on the topic. Ethereum represents the gateway to a worldwide, decentralized computing paradigm. This platform enables you to run decentralized applications (DApps) and smart contracts that have no central points of failure or control, integrate with a payment network, and operate on an open blockchain. With this practical guide, Andreas M. Antonopoulos and Gavin Wood provide everything you need to know about building smart contracts and DApps on Ethereum and other virtual-machine blockchains. Discover why IBM, Microsoft, NASDAQ, and hundreds of other organizations are experimenting with Ethereum. This essential guide shows you how to develop the skills necessary to be an innovator in this growing and exciting new industry. Andreas M. Antonopoulos is a critically acclaimed bestselling author, speaker, and educator, and one of the world's foremost Bitcoin and open blockchain experts. Andreas makes complex subjects accessible and easy to understand. He's well-known for delivering electric talks that take blockchain's complex issues out of the abstract and into the real world. Gavin Wood is a co-founder and former CTO of Ethereum and inventor of the Solidity contract-oriented language. He is also founder and president of Web3 Foundation, founder and CTO of Parity Technologies, and advisor and founder of organizations including Grid Singularity, Blockchain Capital, Polychain Capital and Melonport.